Easily send your Evernote note title as a task and include a link to the note in the task description. TaskClone also clones individual Evernote tasks to task apps or to a "task list" note. Create a notebook named "TaskClone" if one is not already created. Place a note in the "TaskClone" notebook. Sync/Save Changes. Evernote mobile apps sync automatically. When you sync Evernote > TaskClone is notified of the note, clones the note title and sends it to your task app in less than 2 minutes. Your task app is responsible for converting titles into tasks which can take from 0-5 minutes. When TaskClone is finished > the tag "cloned" is added to the note so you know the title was sent as a task. Important! 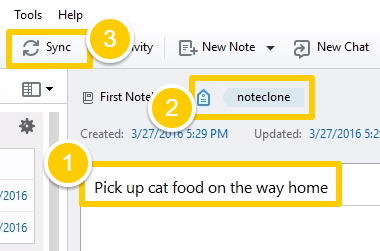 Do not edit the note until Evernote syncs again and you see the "cloned" tag or you risk creating a conflicting modification because TaskClone is editing the note to add the "cloned" tag at the same time you are editing. Add the tag "noteclone". This tag will be created in Evernote the first time you use it. Note: Please do not add this tag in TaskClone settings as it is an embedded tag and is automatically recognized. When TaskClone is finished > the "noteclone" tag is removed and the tag "cloned" is added so you know the title was sent as a task.